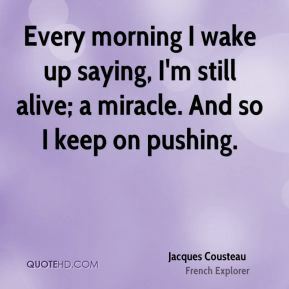 Really, the whole thing's a miracle. 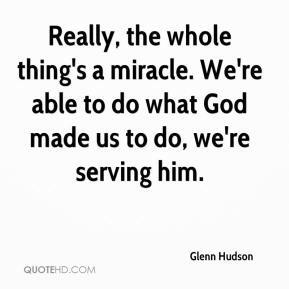 We're able to do what God made us to do, we're serving him. 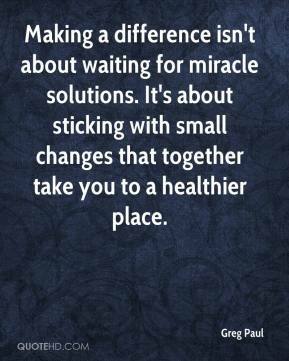 Making a difference isn't about waiting for miracle solutions. It's about sticking with small changes that together take you to a healthier place. We pray to God that those men come out alive. 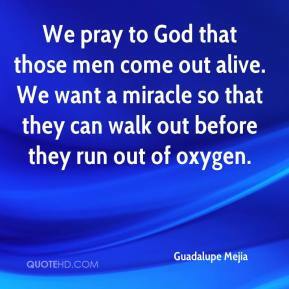 We want a miracle so that they can walk out before they run out of oxygen. 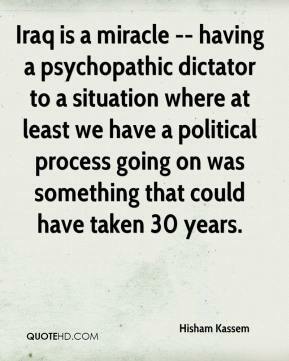 Iraq is a miracle -- having a psychopathic dictator to a situation where at least we have a political process going on was something that could have taken 30 years. 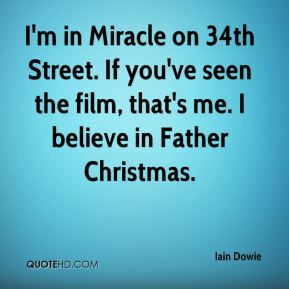 I'm in Miracle on 34th Street. If you've seen the film, that's me. I believe in Father Christmas. 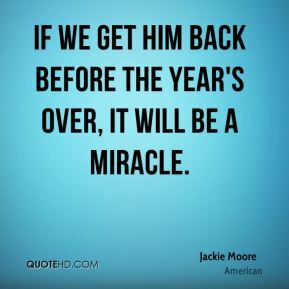 If we get him back before the year's over, it will be a miracle. We're just tickled to death. It's just about unspeakable to me. It's a miracle within itself. 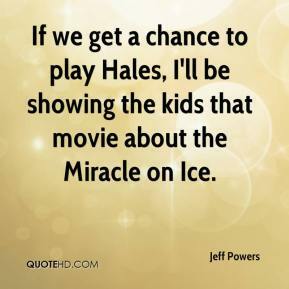 If we get a chance to play Hales, I'll be showing the kids that movie about the Miracle on Ice. I want to pay homage to the crew, ... I don't know if we should speak of a miracle, but we can certainly speak of the training of the crew, above all the professionalism of the crew. 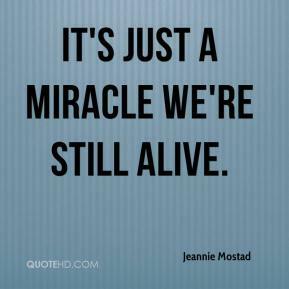 It's just a miracle we're still alive. I might still be up there ... 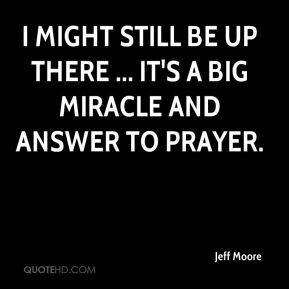 It's a big miracle and answer to prayer. 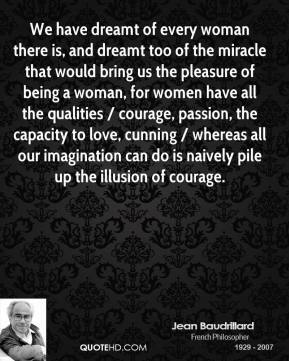 We have dreamt of every woman there is, and dreamt too of the miracle that would bring us the pleasure of being a woman, for women have all the qualities / courage, passion, the capacity to love, cunning / whereas all our imagination can do is naively pile up the illusion of courage. 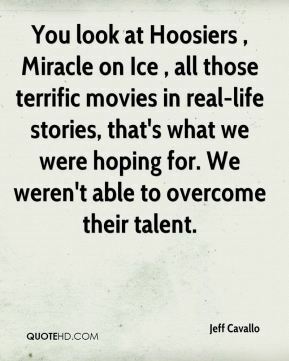 You look at Hoosiers , Miracle on Ice , all those terrific movies in real-life stories, that's what we were hoping for. We weren't able to overcome their talent. 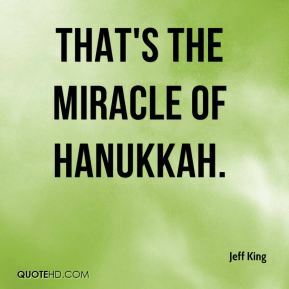 That's the miracle of Hanukkah. He's undoubtedly a miracle. 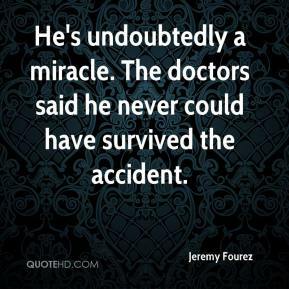 The doctors said he never could have survived the accident. We got to see a miracle happen. We went for his check up. The doctor did an ultrasound and said the tear in his liver was healed up and he could resume normal activities. 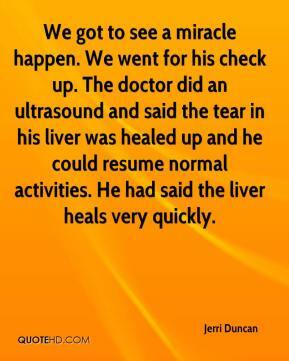 He had said the liver heals very quickly. 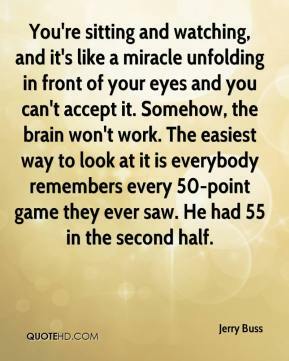 You're sitting and watching, and it's like a miracle unfolding in front of your eyes and you can't accept it. Somehow, the brain won't work. The easiest way to look at it is everybody remembers every 50-point game they ever saw. He had 55 in the second half. [It would be] a miracle if it ever happens, ... 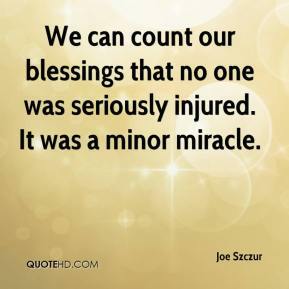 But I believe in miracles. 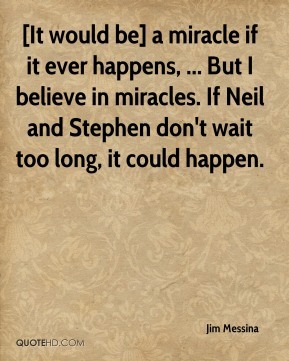 If Neil and Stephen don't wait too long, it could happen. 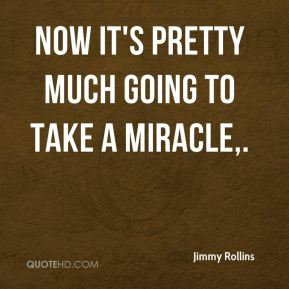 Now it's pretty much going to take a miracle. 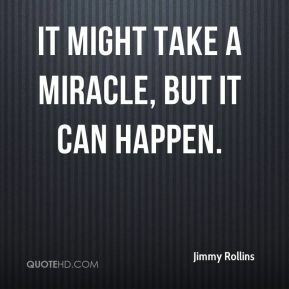 It might take a miracle, but it can happen. 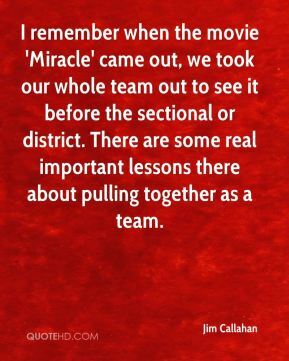 I remember when the movie 'Miracle' came out, we took our whole team out to see it before the sectional or district. There are some real important lessons there about pulling together as a team. 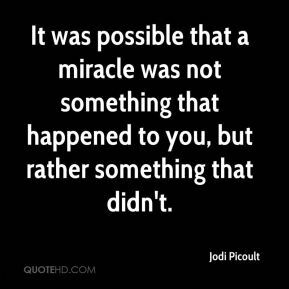 It was possible that a miracle was not something that happened to you, but rather something that didn't. We're losing time. Time is working against us. 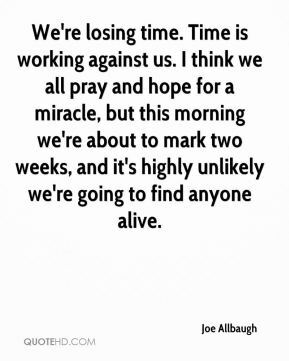 I think we all pray and hope for a miracle, but this morning we're about to mark two weeks, and it's highly unlikely we're going to find anyone alive.